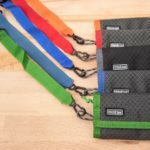 The InReach Mini is a two-way satellite messaging and GPS tracking device that can easily fit in your pocket or be clipped to a belt or backpack shoulder strap. In this review I’m going to talk about the primary features and my experience with the device during the first month of owning it. 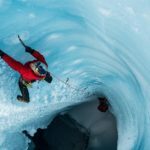 Here on Shutter Muse we are first and foremost a photography website, but due to the fact that I write almost exclusively about various types of outdoor and adventure photography there are often useful piece of outdoor gear that I use on a weekly basis. This InReach Mini is one such item, and it was purchased with my own funds. I used to own the InReach SE which came out a long time ago when the company was owned by DeLorme. 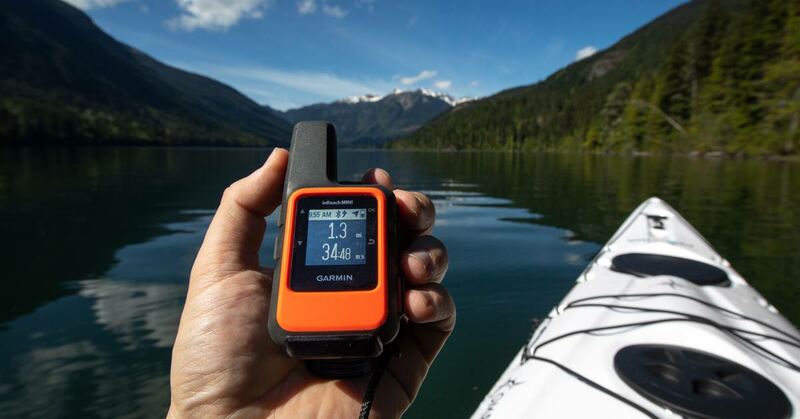 Since then, Garmin absorbed the InReach brand and launched the InReach Explorer which was the first product to combine original InReach DNA with Garmin’s own DNA. The InReach Explorer looks like a great product but I was a little hesitant about the size of it when I first saw it, so I didn’t bother to upgrade from my old InReach SE. When the InReach Mini was launched, that was a different story. The Mini is less than half the size and weight of the Explorer+, and for my purposes it ticks all the necessary boxes. For some people, size and weight might not be a primary concern, but let me tell you that as a photographer who already has 30 lbs of gear to carry, it really does matter. It also doesn’t hurt that the InReach Mini is $100 cheaper ($349 vs $449 for the Explorer+). 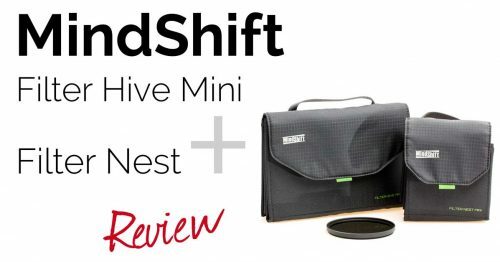 As you’ll see in this review, the Mini is mini in name only, and not in functionality. The real difference between it and its larger brother, is the lack of built-in mapping. 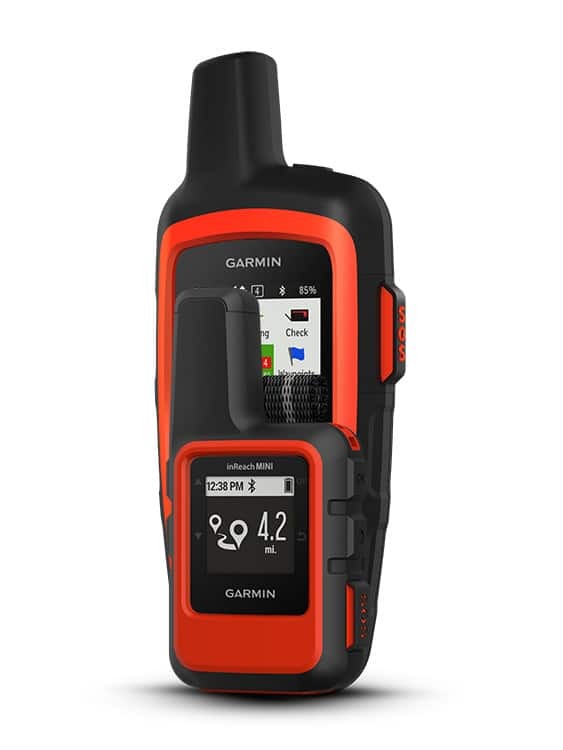 However, the InReach mini pairs so seamlessly to Garmin’s mobile EarthMate app, that this isn’t going to be a huge concern for most people who have a mobile device with them anyway. Let’s face it, that really is most people these days. The Explorer+ also has a built-in compass and barometric altimeter, which the Mini does not, although altitude and compass bearings are calculated via GPS on the Mini anyway, albeit slightly less accurately. The carabiner attachment is incredibly useful! Note: IPX7 water resistance means the device must be able to withstand total immersion in up to a metre of water for 30 minutes. When you get your device you need to sign up for a subscription plan through a Garmin account. This is much like setting up a mobile phone account and there are various packages available that include certain amounts of messages and tracking options within the monthly price. If you go over your allotment, you’re charged on a per message or per tracking point basis. Prices vary from country to country, and there are discounts available if you sign up for a yearly plan instead of a monthly one. The other important difference between yearly and monthly plans is that the monthly plan can be put on hold at any time, although there is a $24.95 annual fee regardless of whether you use the InReach in the year. If you only plan to use your InReach for specific, sporadic expeditions, or in certain months of the year, the monthly plan is for you. 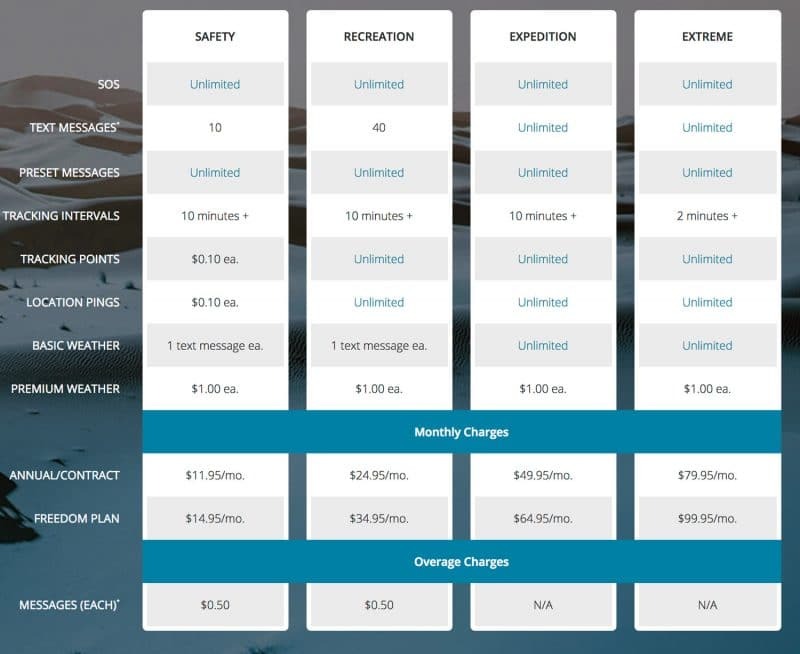 Current US subscription plans are included below. These are correct at the time of publication (July 2018), but they might change in the future, and they are country specific. Whether you choose to send a message to someone’s phone as a text message, or to their email address, the message includes your GPS coordinates and a link to a map that they can click to get an immediate view of where you are. First you can send preset messages that are created ahead of time using the InReach web portal. These would be common messages such as “Just checking in. Everything is fine and this is where I am”. For preset messages, you choose both the text AND the recipient of the message while you are creating it in the InReach web portal. Preset messages are FREE to send! Even the cheapest, basic InReach monthly plan allows you to send an unlimited number of preset messages. This is great if you want to keep in touch with friends or family to constantly let them know you are ok and give them a location update. Many people do no realize that these preset message are free to send, but it should be noted that if someone replies to one of your preset messages, that will cost you one message from your monthly plan’s tariff. It’s therefore important to develop a system with whoever you are messaging, so that they know to only respond to these preset messages in an emergency. The second kind of message is called Quick Text. Again, these are initially created in the InReach web portal, but this time they are just text and do not have a specific contact phone number or email address associated with them. On the InReach device, you first choose your Quick Text from the list, then you choose the contact you want to send it to. It’s a very quick process, and simple even with the limited button layout of the Mini. It’s very important to understand that Quick Messages do cost you money from your monthly tariff, unless your plan includes a certain number of messages in it. Quick Messages are not the same as the Preset Messages we talked about in the previous paragraph. You can even share to Facebook or Twitter! The third way to send a message is to have your InReach Mini paired with your phone running the EarthMate app. You can then use the messaging part of the app to compose and send a message to anyone you like. No need to manually state your location, as I mentioned above, this gets appended to the end of your message automatically. The fourth way to send a message is to use the InReach Mini itself to compose a new message. 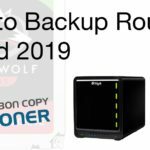 With the limited buttons on the device, this is a slow process and should really be treated simply as a backup option if your phone has died, or if the Preset or Quick Messages are not sufficient for your situation. It takes me about two minutes to compose a useful message using this particular method. Not terrible, but the other options are better if they are available. Messaging works well as long as your device has a clear view to the sky. When I was out in open water, messages would typically send within 10-30 seconds. When surrounded by mountains, I sometimes found it would take a couple of minutes for them to send. I think this is to be expected though, and if you’ve owned an InReach in the past then you know what to expect. I have to say that I just love being able to stay in touch with someone when you need a few words of encouragement during a tough, physically challenging adventure. I know my partner also greatly appreciates knowing I’m safe, and knowing where I am. Even during the first month of using this device, I leaned on it to message with her as I struggled with low energy and rough ocean conditions on a kayaking circumnavigation of Bowen Island, and just ten days later I collapsed from heat stroke on another paddling trip. The boost that it gave me, when I was able to communicate with her in those harder times, was something I’m really grateful for. Most people talk about the InReach as a rescue device, which it surely can be too, but it’s also a wonderful motivational tool if you have a supportive friend, partner or family member on the other end of it while you’re out doing something challenging. If things go really wrong for you, flip open the protective hatch on the side of the device and press the SOS button. This will immediately alert local search and rescue services and they will contact you to start two-way communication with you about your condition, if you are able to reply. Hopefully you won’t have to use this function, but it gives me huge peace of mind to know it’s there when I’m on solo outdoor missions. My work takes me to varied environments, and also puts me in close contact with animas such as grizzly bears, so there’s any number of reasons why this is a good thing to have with me at all times. One thing of note is that you need to be able to press the SOS button if you have that emergency, so don’t go burying your device in the bottom of your pack! One of the features that I most enjoy about the whole InReach ecosystem is a feature called MyMap. Every InReach device has its own dedicated map page that can be accessed using a specific, user-specified URL. You can then set your device to send location tracking points to that publicly viewable map at set intervals. If you want friends or family to keep one eye on your progress during an adventure, this is simply awesome. 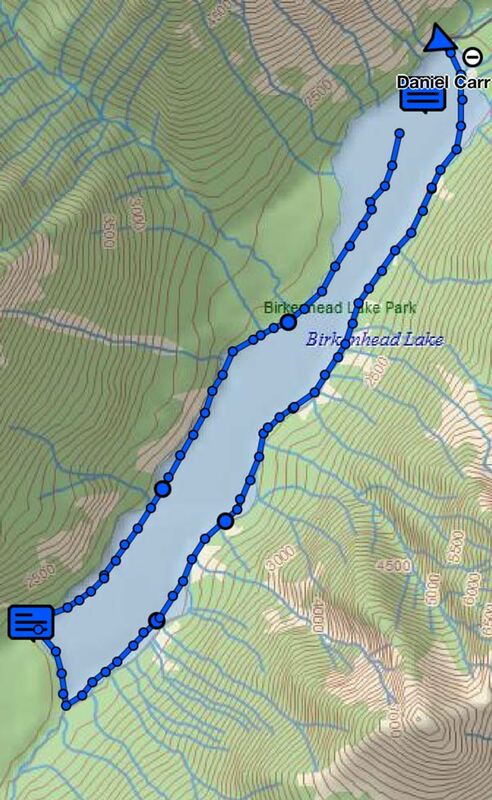 You can even embed the map onto a web page, so if you have a longer expedition taking place, you can put the map on your website and have people follow you along the route. This MyMap feature is available for all InReach devices, not specifically the InReach Mini. 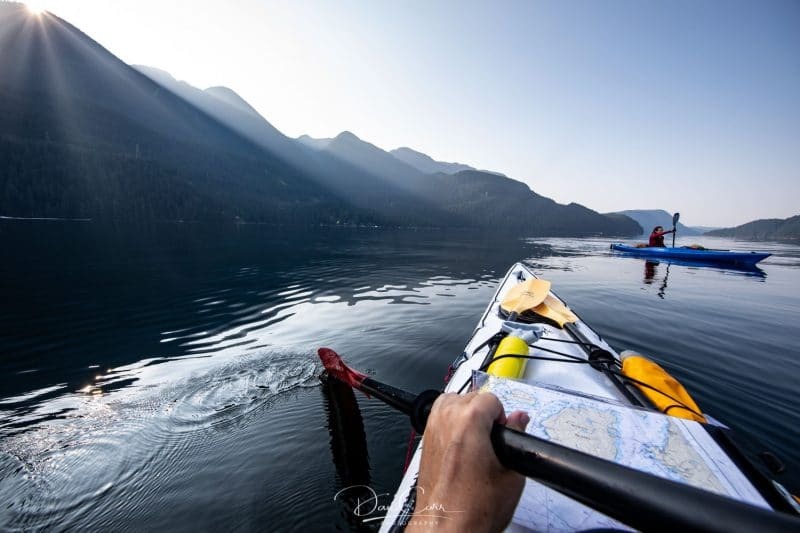 I particularly liked this feature while I was kayaking the Bowen Island route because it meant that I could just set it and forget it, and know that my partner was able to keep an eye on my progress. In cold, wet, rough conditions, it’s not practical to keep getting the device out and manually messaging someone, so the MyMap feature, combined with a pre-determined tracking interval really solves this problem. It worked perfectly! You can turn access to the map on and off, and you can also change the URL for your map so this gives you some varying levels of privacy. If you make your map’s URL public for a trip so many people can follow you, there is then the option to change the URL at a later date if you just want to give the new URL to a loved one so that only they know where you are. 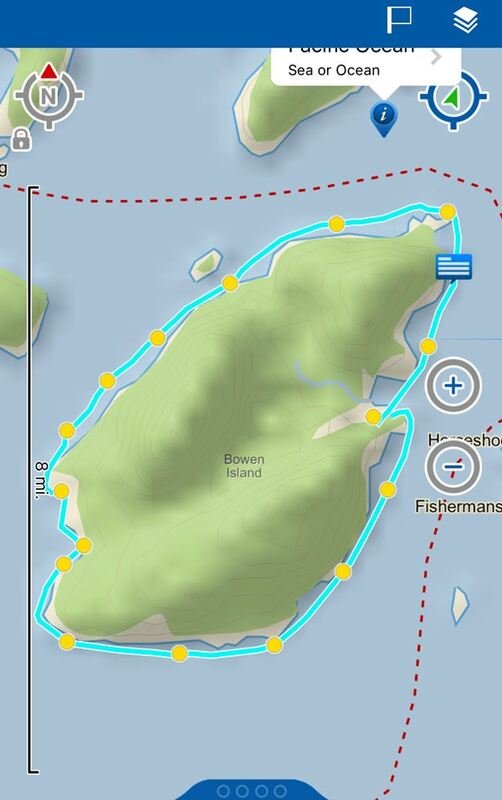 This shows the EarthMate app map screen after my 35km circumnavigation of Bowen Island one day this summer. Each yellow dot is a tracking point that was also sent to my MyMap for my partner to view my progress, and the blue line is the GPS log which is set to a much shorter interval than the tracking points. When talking about the functions of an InReach these two terms, tracking and logging, are extremely important to understand. They mean very different things and there are MANY incorrect reviews and tutorials out there that confuse them. Heck, even Garmin’s own support line confused them when I rang them with a query! Tracking is where the InReach communicates with a satellite to relay your location information to your public MyMap or to relay your position to your own map in the InReach web portal. Unless you have an InReach plan that has unlimited tracking, there is a cost for each track point that you send. You can set your tracking interval to OFF if you do not want to automatically send track points to your MyMap, or you can choose from a list of time intervals, with the default being 10 minutes. The best way to think about logging is that it’s just like what a regular hand-held GPS device does, or just like when you record your movement on a mobile mapping app such as Gaia. 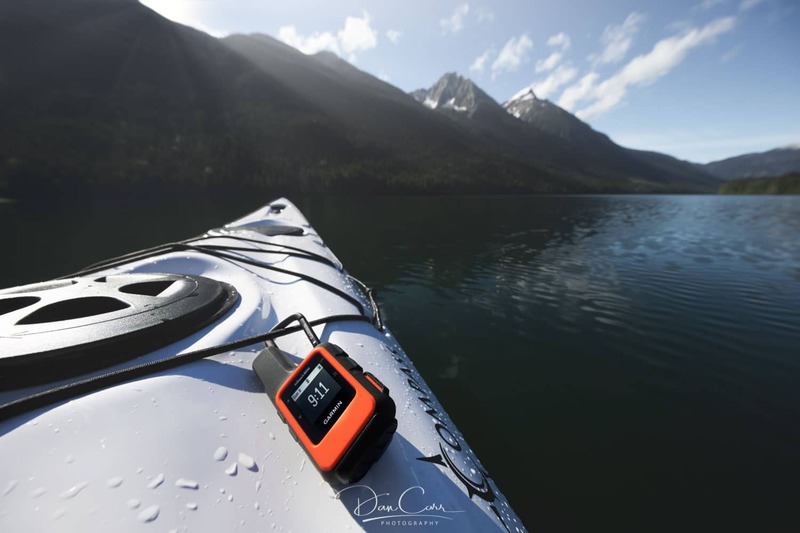 The device simply records your GPS coordinates at a specified interval, and this log of GPS points is stored inside the InReach until it is able to sync to your Garmin account via the EarthMate app or a USB connection. If your phone is connected to the EarthMate app then the log is also sent automatically to the app so you can view it on the map in real tim, but logging is essentially “for your eyes only”. The log is NOT sent via satellite to your MyMap, therefore there is no cost associated with using it. Use logging if you want to record where you have been during your day, but you do not require anyone else to be keeping an eye on your progress remotely. There is no associated cost with logging, so apart from using up more battery life, there are no other downsides to setting a shorter log interval. The default is 2 minutes, but it can be set down to as low as 10 seconds if you need hyper-accurate GPS logs. While the EarthMate app shows a somewhat simplified version of the map and logging, you can view more detail if you log into your InReach web portal. On this trip you can see logging points indicated by the small blue dots, and tracking points indicated by the larger blue dots. You can also see where I sent messages, and clicking the messages reveals their content. For this three day trip I disabled automatic track points and just let the device use the logging function, choosing instead to send occasional messages with attached tracking points to my partner. This is actually a collection of logs from the three days, but the EarthMate app shows you all your logs, not just the most recent one. These two things, tracking and logging, serve very different purposes, but unfortunately Garmin hide both of them in a section of the menu called “Tracking” and the command on the screen is “Start Tracking” even if your tracking is set to OFF, and you are in fact only logging, which costs nothing. I think this is where most of people’s confusion comes from. 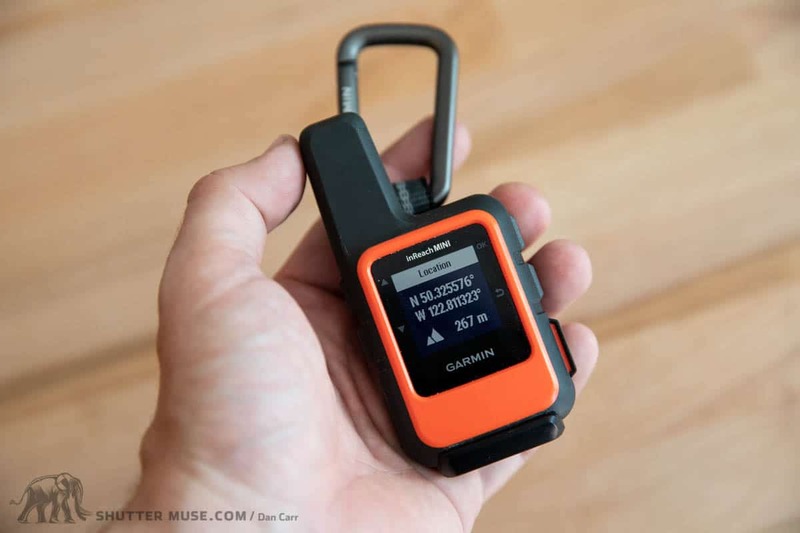 It’s unfortunate because I believe this misunderstanding has prevented some people from buying these devices, when they erroneously think that any kind of GPS logging with an InReach is going to cost you money. I like to use the automated tracking interval option when I’m adventuring solo, so that my partner can keep an eye on my progress automatically. When I’m with other people I tend to turn tracking off and just record a log using the logging function, for my own personal reference at a later date, or to see my movements from the day on the EarthMate app . I’ll then manually send a track point to my partner via a text message at important points in the day so that she knows where we are staying for the night, and what time we are setting off again in the morning. If you do have people watching your MayMap remotely, you can also manually send a single track point to your MyMap. This would be useful in a trip that lasts many days or weeks, where you could send a track point to your MayMap once a day to keep friends and family up to date with progress, but without incurring the costs that can come with the automated tracking interval. That is, assuming you don’t have an InReach monthly plan that includes infinite tracking points. I’m aware that this is still somewhat confusing, and I’ve tried my best to clear it up. If there is still confusion, please leave a comment at the bottom of the post and I’ll help further to clear things up. Click to view larger. Here you can see the data from that same 3-day kayak trip, but viewed in the InReach web portal. On the left you have stats from each log, and the map offers detailed toppo, satellite or street map data. You can view the forecast on the Mini’s own display, but if your phone is connected to it over bluetooth then it’s a little easier to get the whole picture using the EarthMate app. Like other InReach devices, the Mini can be used to get a weather forecast for the next couple of days when requesting a basic forecast, or the next 5 days when requesting a premium forecast. The request can be initiated from the device itself, or from the EarthMate app, which can also be used to view the forecast. 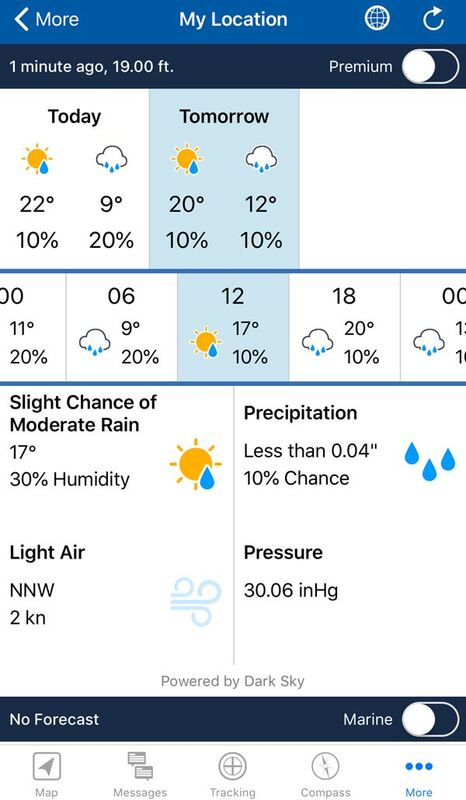 Forecasting is provided by DarkSky.net services and seems to be about as accurate as you could hope for. I’m sure this would be a particularly useful feature if you were on longer 5+day trips. Conveniently, the Mini will show current weather conditions on the home screen once the forecast has been requested, or you can cycle through the hourly forecast to see into the future. A marine forecast option is also available. A feature that I think would be nice to add to this is the sunrise and sunset times for your location since this often determines your movements in the backcountry. How about it, Garmin? Given these variations, it’s impossible to give a definitive single number for battery life in hours, so it’s much better to hear my experiences of testing the device in real world situations. 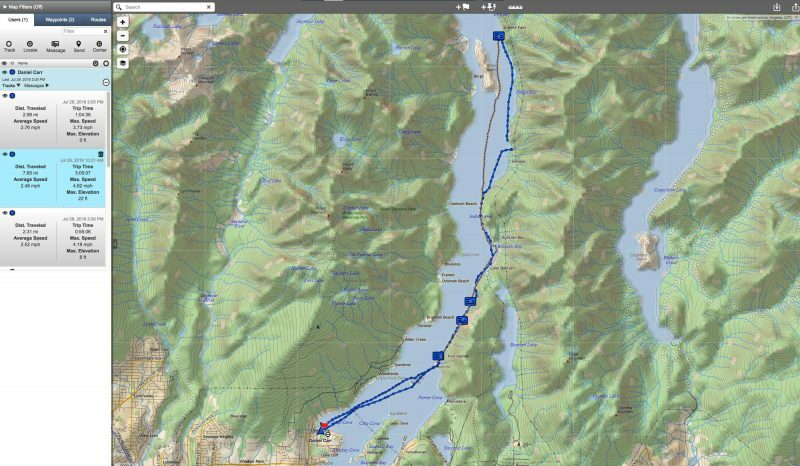 The first big test was my Bowen Island circumnavigation with 30-minute tracking interval and and 2-minute log interval. I also sent and received roughly ten other messages during the day and it remained connected via bluetooth to my phone for the duration. The whole paddle mission lasted 8 hours and at the end of the day I had used about 30% of the battery. It’s worth noting that I also spent a considerable amount of time fiddling with settings and menus as I got used to it on this trip. Considering that it tracked my progress all day and kept me in touch with dry land, I’m more than happy with the battery usage in that scenario, from a device this small. Feeling connected and safe in areas without cell service allows me to confidently pursue new photos in remote locations. 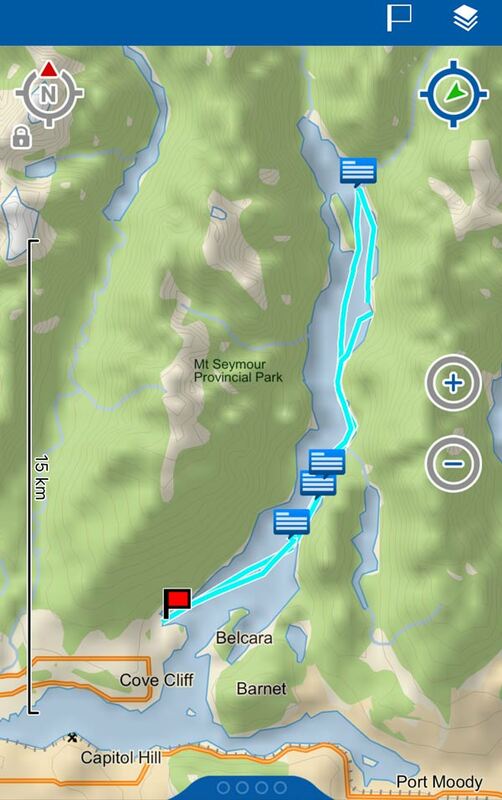 The second big test was a three day kayak trip where I wanted to log the paddling we did on all three days, but this time didn’t have a need to send tracking points to the MyMap because I wasn’t travelling solo. I disabled tracking, left logging set to 2-minute intervals and had my phone connected over bluetooth for the duration of the trip. During the three days, I did send about ten text messages from the InReach too. Whilst I turned the device off at night and only tracked out daytime kayak movements, I finished the 3-day trip with 35% battery remaining. Three days seemed like a long time for such a tiny device, so I had packed a small Goal Zero solar panel in my kit just in case I needed to top up the InReach, but in the end it was even nearly necessary. Having conducted my own tests over the past month, it seems to me that Garmin’s claims about battery life appear to be quite accurate. For the average person who is doing 1-2 day trips, the battery life on the InReach Mini is going to be fine. 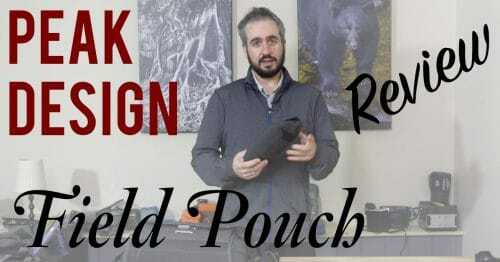 If you think you’re going to be in the field for longer than this, you can easily give it some extra power with a small solar panel or a battery like the previously reviewed Venture 30 battery from Goal Zero. The Venture 30 makes a great partner to the InReach because they are both built tough enough to withstand all kinds of weather and environments. Overall, in this category, I was left more than happy with the Mini’s performance. Honestly, due to the minuscule size of the device, and hence internal battery, I had expected it to be good for about a day of heavy usage, so it was a really great surprise to see it far outperform my expectations. Some of you might be wondering whether there are any specific features of an InReach that might benefit photographers. One thing that I do find helpful is the waypoint function that essentially allows you to quickly mark a specific GPS location with a flag. You can do it in a couple of clicks on the device itself, and if you have it paired to a phone you can easily rename the waypoint to provide specific details. One you’re at home and logged into the Garmin InReach portal, all your flagged waypoints are visible on your map and you can add more information and change the icon of the flag to something more appropriate. This is a great feature for marking locations while you are scouting, or for marking the location of wildlife so that you can, over time, begin to get a sense of location patterns. While there are many iOS and Android apps that can also mark GPS positions, what I like about this is that everything syncs so well between your InReach device, your phone running the EarthMate app and also the Garmin web portal. You can come home from a trip and immediately open your map on the computer to see all your newly flagged locations, as well as your tracks. These waypoints are also not stuck forever in “Garmin Land”. You can export GPS data from your InReach portal to standard GPX files, and there are options to include only your flagged waypoints if this is what you want. In the future, if you wanted to move away from using an InReach, you could export your data to Google Earth or some other mapping software as you please. The other thing that I personally think is worth noting is that a device like this gives me more confidence to venture further off the beaten path when searching for exciting new images. In a world where creating unique images is increasingly difficult, I appreciate the added confidence boost that this device gives me to explore new areas. As you can probably tell already, I’m really excited about the InReach Mini. I’m continually amazed by how small this thing is and if you’re someone that is already carrying a heavy pack full of gear (photographers! ), this small size and weight is greatly appreciated. Not only do it find it comforting to know that I can use the SOS button in an emergency, but I also get a lot of motivation from staying in touch with people back home when I’m out on my own. Keeping a better set of trip logs is also beneficial for future planning because you’re able to look back on past adventures to check times and distances. 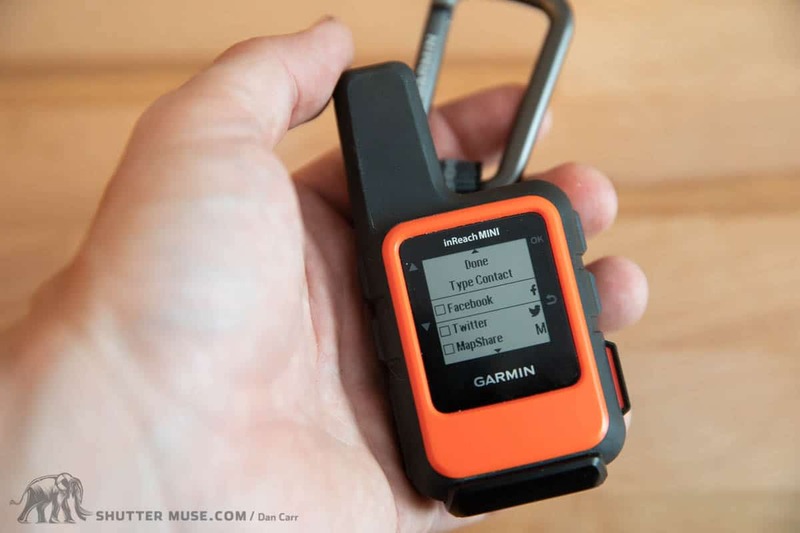 I really think that this device is going to knock a huge chunk out of sales of the InReach Explorer+ because the only major difference is the lack of mapping. Mapping can easily be done on your mobile device anyway, using a different app, or Garmin’s own EarthMate app which allows free downloads of topo maps, street maps and nautical maps from all over the world. Before using it I had some concerns about how easy it would be to use with only four small buttons, but Garmin did a fantastic job with the user interface and frankly I find it easier to use that my old InReach SE. Menu flow is intuitive, the display is clear in bright light, battery life is excellent and I never once had any issues with the bluetooth sync and control through the also excellent EarthMate app. The InReach Mini is a truly excellent product and I never leave home without it in my camera bag now! 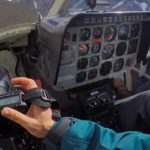 This is far and away the best review and explanation I have read of the inReach Mini, and I have read quite a few in an effort to make sense of Garmin’s muddled documentation. Thank you for explaining the difference between logging and tracking. Until I read your explanation I had come to the conclusion that the device would only be useful for contacting S&R in case of an emergency. Now I know that I can keep a log of my route without incurring any charges beyond my basic safety plan monthly fee. Garmin should provide all customers with a link to your site and pay you well for explaining their product with a level of clarity they were unable or unwilling to muster. Thanks Steve. I”m really glad that this particular point came across so clearly to you. It’s something I struggled to understand myself prior to purchasing the Mini. 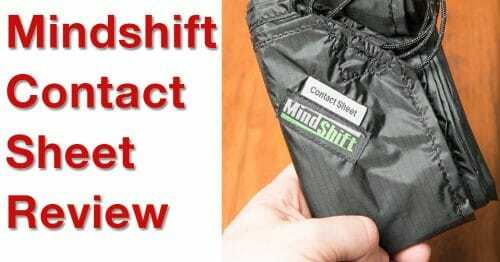 I have continued to use the Mini every week since I wrote this review and I love being able to record where I went, without clocking up a ton of overage charges. Exсellent site you hae here.. It’s hard to find һigh-quality writing like yours these days. I honestly appreciate people like you! Take cаre! !